Thanks to a cheap flight from Ryanair we could extend our holiday in Riga with a short trip to Tampere. We arrived quite late, so we went directly to hotel. I was puzzled when they did not have any reservation for us, but then it came to me, that we are in a different one ! It was another we checked while searching for accommodation. I felt quite stupid for the rest of the day because of that mistake. The Mango hotel was not so far from the centre. The room was furnished with an antique furniture, it looked very good. Early morning we went for a breakfast. The food was really good, we spend there almost an hour (I had to try everything . We walked in the city in the same way like we had done in Riga before – using map with points of interest. We also stopped in the souvenirs shop. I was very surprised that in the Christmas souvenir shop in the middle of Tampere there was a collection of merchandise with Czech „Krteček“ . We came to Tampere not only to see the city, but also to visit the Särkänniemi amusement park. Just to see some of the roller coasters made my stomach sick. We tried some of them, but not the „Vertigo“, it was too crazy. Look at the pictures, it is the one, where the people are mostly upside down . 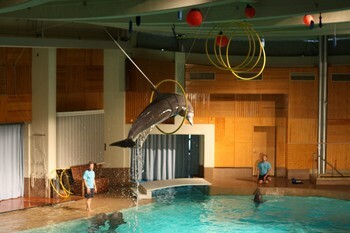 We visited also some easier attractions and ate lunch. I also had to buy candy cane , because I had not had it for a long time. In the evening we went to catch a bus back to the airport. To catch, literally. Buses in Finland do not stop on the stations unless you stay on the edge of the side walk waving. Our bus was going behind the another one and almost did not bother to stop, maybe because the driver thought everybody wants to the first one. But thanks to Alina (and her running and waving) the bus picked us up . 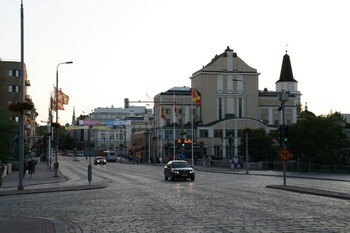 The rest of the trip was quite tiring, we had to wait for several hours in Riga for the bus back to Vilnius. We arrived in the morning. At home we fell asleep and slept almost till the evening. Last week we went for a short holiday. 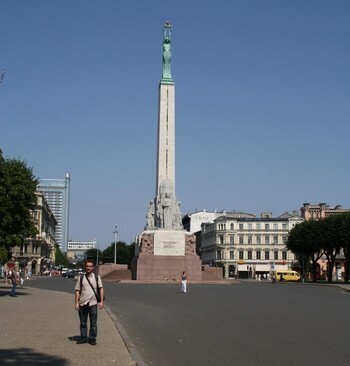 Our first destination was Riga, the capital of Latvia and Jurmala, the seaside town nearby. We took an early morning „Eurolines Lux“ bus. It was very comfortable with lot of space, I could sleep relatively fine during the journey. In Riga we took a map of sightseeing trip and decided to walk around and visit all points of interest that were picked there. It took us couple hours to see everything. I liked the parks the most, because it was a lot of shade in them providing us a shelter from the burning Sun . When we had enough of Riga, we proceeded by train to our accommodation in Jurmala. The train, despite its look from the distance, was renovated nicely with comfortable seats (Czech Railways, take an example, please). It started to rain heavily just when we were arriving to our destination. I am glad Alina had had an idea to buy new raincoats for the trip, they came very handy. We came to the camp, checked in, had dinner and fell asleep early, because it was an exhausting day. 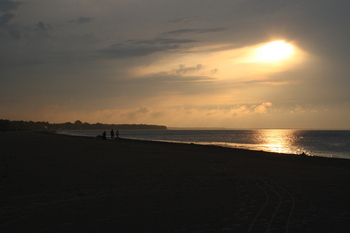 Next day we decided to take an 8 km walk on the beach to Majori, Jurmala's city centre. The weather was again very warm, but wind and sea was cooling us a little. In the centre we found a not so expensive restaurant (although the prices were high everywhere) where we had a lunch and beer. We walked in the centre for some time and then took a bus back to the camp. I have finally got some time to write posts about recent events, they will follow after this one. 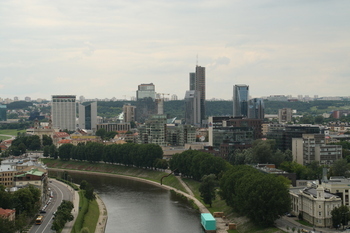 But first I would like to share some pictures from Vilnius. Most of them I took while I was walking in to the city centre and back. On Friday we decided to relax and visit Trakai, a small town not far from Vilnius. We took a bus and in less than 45 minutes we were there. The weather was beautiful, just the temperature could be lower. 28 degrees in shade was too much for me. The town is almost entirely surrounded by large lakes. In the northern part there is a large castle on an island. We did not go inside, but we took a boat trip around the lake. The funny thing was, that as soon as we entered the boat, it started raining heavily. Everywhere you could see sunshine, but our boat was almost the whole way under the small rain cloud . Although the weather was too hot and tiring, it was a very nice spent Friday. It was the first of many trips we plan to make in the Baltic region.